The third version of Tony Hamlin‘s signature Solace frame from Kink has arrived. The Solace 3 is made from 100% seamless Sanko 4130 chromoly tubing with a 75.5-degree head tube angle, 71-degree seat tube angle, 11.75″ bottom bracket height, 8.75″ seat tube height and a 13.2″ (slammed) chainstay length. You can find an integrated head tube angle, gusset on the down tube, internally and externally machined Mid bottom bracket, integrated seat post clamp, a wide back end for 2.40″ tires and fully CNC machined dropouts with integrated chain tensioners. The Solace 3 is completely brakeless and does NOT have any mounts. The 2017 Solace 3 frame is available in 20″, 20.5″, 20.75″ and 21.15″ top tube lengths with colors of ED black, translucent gold and translucent black and gold splash with a weight of 4 lbs. 14 oz (20.5″). 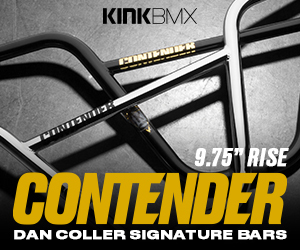 The frame is available through BMX shops and mail-orders that carry Kink Bike Co. worldwide now. Kink have released the latest version of Tony Hamlin‘s signature Solace bars. The Solace 2 bars are made from 13-butted, Tru Therm post-weld heat-treated chromoly tubing with a 9.25″ rise, 28.75″ width, 2-degrees of upsweep and 12-degrees of backsweep. Since the bars are 13-butted, they have extra material in all of the high stress points to help ensure strength, with the full Tru Therm heat-treatment to double up the strength, these should be able to hold up whatever you throw at them. The Solace 2 bars are available in ED black and chrome through BMX shops and mail-orders that carry Kink Bike Co. worldwide now! Merritt just released some fresh clips from some time Tony Hamlin, Billy Perry, Justin Seiller and Mike Stahl spent cruising a few New Jersey spots. This is a pretty raw, rough cut, but there’s plenty of really solid clips worth checking out. Take a peek! A little while back, Kink held a contest where the lucky winner would get the chance to have a session with Tony Hamlin. Here’s a quick video from the trip out to ride with the winner. It’s pretty short, but Tony throws down a handful of real solid clips at the skatepark. Take a peek! “Tony Hamlin headed to West Milford, New Jersey recently, to meet and catch a session with Daniel Kearney; the lucky winner of the #ridewithkink session after purchasing a 2017 Complete Bike during our March promotion. Thanks to Town Cycle for the support! With the increasing popularity of the extreme stunt known as the pick up barspin, Tony Hamlin decided to lend his professional skills to give you some advice and examples of just how to pull this revolutionary trick on a BMX bike. This video is very serious and if you don’t follow it step by step, you probably won’t be able to pull this one off. Hit play, take some notes, grab your bike and chuck ’em! Tony Hamlin posted up this short video from a plaza he tried to ride, and clearly was kicked out of. Although the session didn’t last long, he was still able to get a couple worth checking out. Pretty crazy that there are still skateparks that ban bikes.